Need Veggie Plants? We’ve Got Them Now! If you want a good selection of tomatoes, now is the time to come in! One of our small, one man operation wholesale growers decided to get out of the business and go to work for a larger grower – and we told him we’d buy his inventory of tomatoes and peppers to help out. 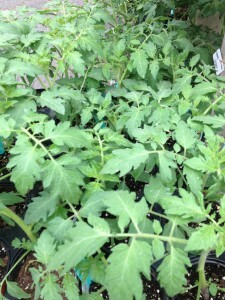 So….we have a LOT of tomatoes and peppers right now – please come and take a look! Most of those we have are heirlooms, and there are some hybrids as well. Tomatoes grow best in a spot with lots of sun – at least 8 hours. Try not to plant tomatoes in the same spot as the year before. Prepare your beds well. Loosen the soil and add soil amendments – some good ones are mushroom compost, cow manure and soil conditioner. Rotating them to different spots will help keep soilborne diseases like bacterial spot and blight to a minimum. When you plant them, plant deeply, burying the stems – new roots will form on the stems under the soil and make a sturdier plant with more fruits. After planting, water well and add mulch. Mulch will help conserve water in the soil and moderate soil temperatures too. Be sure to water them deeply each week. Watering every 5 days or so during the height of summer deeply is much better than watering a little bit every day. To prevent foliar disease, water the soil beneath the plant, not the leaves, and water early in the day. Pinch out suckers – non fruiting branches that form between fruiting stems. It’s best to pinch them out when they’re young, so keep up with this! Stake them. Put in stakes when you transplant them to avoid damaging roots later. We have 7′ bamboo stakes and garden twine. Determinate tomatoes will produce one big yield and be finished. Celebrity is a determinate tomato. Most of those we carry, though are considered indeterminate, meaning the vine continues to grow and as it grows, will produce more flowers and more tomatoes as the season progresses. SunGold: Very popular cherry tomato, SunGold was developed by a Japanese breeder in the 1990s. Good disease tolerance. Yellow Pear: Another that folks ask for every year. Heirloom, with yellow, pearshaped, sweet fruit. Red Cherry: An heirloom, cultivated since the early 1800s. High yielding. Black Cherry: A hybrid, bred in Florida. Sweet, deep red tomatoes with a blackish hue. Mortgage Lifter: Indeterminate heirloom that produces large, pink low acid fruits. Originated in the 1930s, and the developer (with no breeding experience) paid off his mortgage selling his seedlings. Cherokee Purple: Heirloom with a unique dusty rose color. Extremely sweet with a rich, smoky taste. Brandywine Red: An old Amish heirloom from 1885. Beefsteak: Heirloom with 4″-5″ slightly ribbed bright red, sweet fruit. Better Boy: Classic – prolific producer – hybrid. Talladega: Hybrid – developed for the Southeast, it’s a midseason deep red beefsteak tomato. Park’s Whopper: Hybrid – Large, 4″ fruits. Green Zebra: Hybrid developed in the 80’s. Popularized by Chef Alice Waters at Chez Panisse. It’s ripe when the light green stripes turn yellow. Black Krim: An heirloom, it’s a medium size very dark maroon beefsteak tomato. Atkinson: A good hybrid for the Southeast. Developed by Auburn University. Celebrity: Another disease resistant hybrid, this one is determinate, but still will get quite large and produce a lot of fruit. A solid, all purpose tomato. This entry was posted in Garden Preparation, Planting Tips, Vegetables and tagged atkinson tomatoes, black cherry tomatoes, black krim tomatoes, brandywine red tomatoes, celebrity tomatoes, cherokee purple tomatoes, green zebra tomatoes, heirloom tomatoes, hybrid tomatoes, mortgage lifter tomatoes, parks whopper tomatoes, red cherry small tomatoes, sungold tomatoes, talladega tomatoes, tomato plants, vegetables to grow, yellow pear tomatoes on May 7, 2013 by Kris Blevons.